You have maybe heard about the Disney Visa before, particularly when promotions are released. On occasion Disney Visa cardholder have been granted early access to these discounts for booking a Walt Disney World vacation. So what do you get with your Disney Visa? How much does it cost? There are two types of Disney Visa cards a free one and the Premier which is an annual fee applied directly to your card of $49. One of the perks of having either card is the 10% off any purchase of $50 or more at Disney stores and Disneystore.com. Which as we know doesn’t take long to get past that $50 price tag. A 10% discount is also available at dining locations in Walt Disney World and Disneyland Resort. Points can also be earned on purchases made with the Disney Visa. These points can then be turned into a Disney Visa Rewards redemption card. You can earn up to 2% in rewards dollars at gas stations, grocery stores, restaurants, and Disney locations. Also you can earn 1% everywhere else. These points can be used for booking Disney vacations, spending at Disney parks, and Disney stores. You earn points after you have paid on the card. The points never expire but your card can be inactive so be sure to check on this before leaving home and making purchases. Disney Vacation discounts are also available at times with this card. It will be similar to the discounts and promotions that Disney offers to the general public such as a room only discounts or dining promotions. On occasion these promotions are offered prior to general public sales allowing the cardholders a couple of days head start. Discounts on tours are another great perk. You can save 15%! At Disneyland you can try out Welcome to Disneyland, A Walk in Walt’s Disneyland Footsteps, Discover the Magic, Cultivating the Magic and Disney California Story. At Walt Disney World you can try out: Disney’s Family Magic, Keys the Kingdom, The Magic Behind our Steam Trains, Walt Disney: Marceline to Magic Kingdom, Gardens of the World, Undiscovered Future World, Behind the Seeds, DiveQuest, Seas Aqua Tour, Backstage Tales, Ultimate Day of Thrills VIP, Day for Young Families VIP, Epcot Food and Wine Festival, Backstage Magic, Holiday D-Lights, Yuletide Fantasy, Wilderness Back Trail Adventure. In Disneyland and Walt Disney World you can present your card for a private meet and greet with Disney characters. At Walt Disney World it is located in Epcot, Innoventions West daily from 1-7pm. You will receive downloads of the pictures onto your MagicBand. In Disneyland Resort go to Disney’s California Adventure Park next to Monster’s Inc. Mike and Sully to the rescue, daily from 10:30am-1:30pm. Downloads are also available here. For Food and Wine at Epcot there is the Chase Visa lounge with free soft drinks, water and a place to have a break and charge your phone. 10% off select recreation experiences at Walt Disney World are available such as carriage rides or horseback trail rides. For those that want pampering there is a 15% discount for salon treatments valued at $45 or greater or any 50 minutes or longer spa treatments at Walt Disney World. For Disney Cruise Line you can get at $50 onboard credit when you pay for your Disney Cruise Line vacation in full with your Disney Visa card. If you are like me, you probably learned a little bit about a card you already hold! I didn’t know about many of these discounts, which means my Disney Visa may get a workout next time I am at Disney, for the perks of course! Whether you are taking your own vehicle or renting one once you get to Walt Disney World there are a few things you will want to know before you arrive. Self-parking at any of the Walt Disney World Resorts is complimentary if you are staying at a Walt Disney World Resort hotel. Valet Parking is available at select deluxe resorts and is $25 per day. Should you go from one resort to another you do not have to pay an additional time, your valet parking will transfer to another resort. At the 4 theme parks, Magic Kingdom, Epcot, Hollywood Studios, and Animal Kingdom guests will pay a single fee per day. If you are a resort guest, Annual Passholders, Premium Passholders and Disney Premier Passport holder you do not have to pay for parking. You will show your MagicBand at the parking plaza. You can pay this fee with cash or credit/debit card. Electric Vehicle Charging Stations are available at Epcot. 4 ChargePoint charging stations are located in the Journey parking section, on a first come, first serve basis. You will need to use a credit card or chargepoint card to pay for the electricity. The cost is $.35 per kilowatt hour with a minimum service amount of $1.50. One important parking note for Magic Kingdom is that parking is actually at the Ticket and Transportation Center (TTC) and from there a transfer must be taken by Ferry, boat or Monorail. Valet parking is available for $20, payment will be collected at pick up. Self-parking is complimentary for all guests. Designated parking areas are available to guests with a valid disability parking permit at each of the theme parks, resorts and Disney Springs. Have you been itching to create your own MagicBand that fits your personality? Well now you can! The creation station is located in the Tomorrowland Power & Light Co near Space Mountain. There will be 8 different colors to choose from…including the much requested purple! 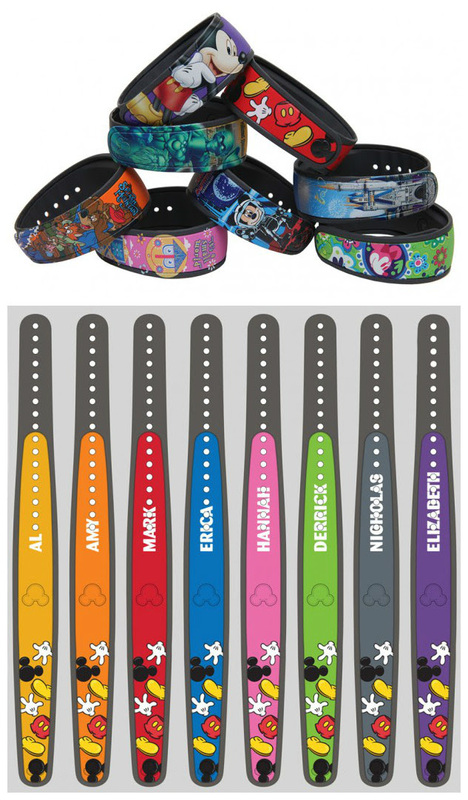 There will be 40 different graphics that you can choose from to customize your band, including some Magic Kingdom ones that will ONLY be available at the creation location. In addition to the graphics, you will also have the opportunity to print your name on the outside of the band! This should be lots of fun! The printers will use UV ink that dries instantaneously and requires no cooling time. In addition, you can link them to your My Disney Experience account right away, or you can save them to give as gifts. The cost for a customized retail MagicBand is $21.95 and a personalized retail MagicBand will be $29.95. Have fun creating! In order to be eligible to test this check-in process you must have a My Disney Experience account with a completed profile and resort reservations must be linked to your My Disney Experience account. Also, you must have received your MagicBands from Disney, have your room balanced paid in full and completed the online check-in set up (along with a PIN number). One last thing, the room packet with a resort map and other information will still need to be picked up at the check in desk. These aren’t necessary but some of Disney’s resorts are very large so this can help you find the layout of the resort while you are there. It is important to remember this is just a testing phase and so there will probably be issues to work out but it could be a really great option to have if you want to go straight to the parks upon arrival. Do you think the new text check-in process is something you want to try? Tell us if you do and how it worked for you!